A houseplant may just seem like one more thing to care for when you are overwhelmed with the responsibilities of caring for a loved one in need, but a pot of azaleas may be just what’s needed to get one through the tasks at hand. These densely flowered, miniature shrubs are cheerful and bright and will look lovely on a tabletop or windowsill for weeks with very little care other than a grateful glance when times are hard. If you are someone who spends time addressing the needs of others, or know someone who is struggling to provide support for elderly parents or an ill child, azaleas are just the right flower to shore someone up when they start feeling worn down. Native to parts of Asia, Europe and North America, the azalea shrub has been a perennial favorite in landscape for its profusion of blooms that cover the whole plant each spring (and sometime fall, depending on the species). The flowers form in clusters that burst forth in reds, whites, pinks and a lovely coral color that last for weeks and completely cover the entire plant. Not content to enjoy them only outside, breeders have carefully selected for smaller and smaller versions of this otherwise large and woody shrub and have come up with several cultivars that are dainty in size, but no less lovely in bloom. 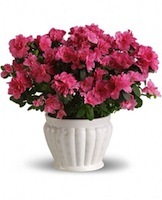 These “florist’s azaleas” have become popular potted flowering plants in the last decade because their blooms last much longer and appear more profuse than other options. Many florists will have them on hand as an alternative to fresh cut flowers that might fade in a week, dressing them in pretty foil or other containers and sold at a comparable price. The shiny, green leaves of an azalea plant make this an attractive houseplant once the blooms have faded. 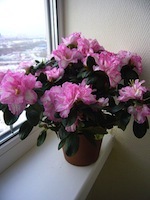 Surprisingly easy to care for, azaleas need just a sunny spot, a weekly watering and a drink of fertilizer in the winter. If this seems like too much trouble, they can just be enjoyed for a month or two and then composted. In the Victorian language of flowers, the azalea is said to carry the message, “take care of yourself.” This is an important reminder for caregivers, when much of their time is spent in the care of others. A carefully placed pot of pretty azaleas can be a nice spot for their eyes to rest, even if the rest of them can spare a moment to relax.